An asthma attack is scary stuff — and living in fear of the next attack is no picnic, either. Pulmonary medicine doctor Mani Latifi, MD, shares three asthma pitfalls to avoid so those inhales and exhales stay nice and smooth. Your asthma triggers are unique to you — that’s why every person diagnosed with mild-to-severe persistent asthma should have an asthma action plan. Don’t have one? Then stop right now and message your provider to request one. When your asthma is well controlled, your provider records your rate using a peak flow meter. At home, continue to measure your peak flow, so you know if you’re closing in on troubled times. 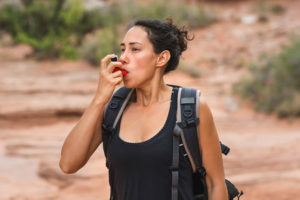 Your asthma action plan also identifies other ways to keep your asthma in line, like using a rescue inhaler to provide short-term symptom relief and a maintenance inhaler that delivers medicine every day for long-term asthma control. Once you experience symptoms, your asthma has already started to spiral out of control. Even at this point, many people push off treatment. They may try to ride out the symptoms for a few days and see if the situation improves. Use a spacer: A spacer disperses the drug more efficiently so the lungs can quickly put it to use. It also results in less of the medicine sticking to your mouth and throat. Rinse your mouth: Rinsing may help you avoid thrush, a white film in the back of your mouth and throat. Steroid inhalers can lead to thrush because the steroid messes with the bacterial balance of your palate. Cooccurring health conditions. Sometimes, unrelated conditions can trigger asthma. Seasonal allergies like hay fever can cause inflammation in the nose, just like allergens cause inflammation in your lungs. Gastroesophageal reflux disease (GERD), the backward flow of stomach acids into the esophagus, can irritate the airways and lungs, making asthma worse. Manage GERD (and asthma) with changes like eating smaller meals, raising the head of your bed or using reflux medications. Even if you have an asthma action plan, don’t forget to stay in touch with your provider. A doctor can help monitor whether your asthma is under control or if you have a serious need that requires attention. And if you enter the asthma danger zone, don’t dawdle — message your doctor then head to the nearest emergency room for immediate care.